Thermography Breast Screening and Natural Mammogram Alternative in Ojai, CA. We provide holistic, natural full body and breast screening using safe, non-invasive, no-radiation thermal scanning in Ojai, California. At the Ojai Breast Thermography Center we offer breast as well as full body thermal imaging for women and men. You will receive gentle and compassionate care which includes holistic counseling for optimal health and wellbeing. Should we see "hot spots" we will guide you towards the best remedies or the right health practitioner for your needs. We never leave you to fend for yourself after your thermal imaging and consultation. Once you are a client of ours, you will always be considered a client. We are always available for inspiration, guidance and support. We will make time for you, whether by email, phone, or an in-person consultation. Contact us today at 805-560-7602 to schedule your appointment in Ojai and achieve the peace of mind that comes with early health awareness and prevention. We provide state-of-the-art thermal breast screening in Ojai, CA. Breast thermography is a painless and simple non-invasive, no-compression and radiation-free procedure that can alert your physician to health conditions that may indicate early stages of breast cancer or other disease. Breast thermography is FDA approved and has been shown to detect breast disease earlier than mammograms alone. Breast thermography is best utilized as part of a multifaceted early detection program that includes self examination, physician examination and mammography. Such a proactive approach allows women of all ages the opportunity to increase their chances of detecting breast disease at the earliest possible stage. All images are kept on record so as to form a baseline for all future routine tests. 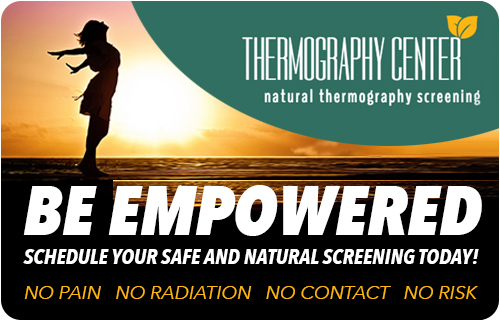 We provide full body thermographic screenings for men in Ojai, CA. Full body thermography is a state-of-the-art procedure that creates thermal images that capture heat patterns in the body’s physiology and can detect hidden health issues. A healthy body is thermally symmetrical. Full body thermal imaging creates a digital “map” of the body that can show abnormalities and asymmetries that can indicate inflammation, which is often the precursor to many diseases such as cancer, heart disease, diabetes and arthritis. Full body thermography is the only health procedure that detects inflammation early enough to help you and your physician to prevent negative health conditions from developing. We provide full body thermography for women in Ojai, CA. While focusing on breast health is vital, full body thermography seeks to uncover hidden health issues in other parts of the body from head to toe. Thermography makes it possible to be aware of our own health condition and show us which areas of the body to target. Diseases typically do not appear overnight. They often develop silently for years before their effects show up in the outer circumstances of our health and lives. We are simply unaware of them. Since research has shown that a common precursor to most if not all diseases is inflammation - a condition not seeing by conventional tests like MRIs and X-rays - thermography is the best path to early detection. We provide health and wellness plans based on the findings of your thermography report. Thermography screenings do not treat negative health conditions but act to prevent them by allowing you a “first glance” at of your body’s overall condition. Thermography checks for numerous conditions, especially inflammation, a common denominator in most diseases. If your report findings indicate possible early onset of inflammation or disease, our detailed health and wellness plans - individualized for you based on your report findings - can help you address these issues and conditions through nutrition, exercise, supplements and lifestyle changes.